Take your HostPapa shared web hosting plan to the next level! Cloudflare will boost your website performance in minutes – and it's absolutely FREE* to Business and Business Pro plan customers. HostPapa has partnered with Cloudflare so that we can offer our customers the best web hosting experience possible. By joining the Cloudflare community, you'll have access to performance and security resources previously reserved for large websites. You can now enable this powerful service quickly and easily, right from your HostPapa control panel (cPanel).. The Cloudflare content delivery network automatically stores your static content at locations around the world for faster delivery. Websites load, on average, twice as fast after enabling Cloudflare. And search engines love fast-loading websites! Cloudflare optimizer includes a number of tools to speed delivery of all web pages – even those with ad servers, third-party widgets, databases, and tools – to computers and mobile devices. The size of the Cloudflare community enables access to the fastest routes and biggest pipes. Content is delivered through Cloudflare's distributed network, offering you redundancy: if there is a problem at one data centre, visitors can be rerouted to another, ensuring your website's peak performance at all times. The Cloudflare community is always on the watch for the latest threats from hackers and spammers. Once detected, new attacks are blocked for the entire community. Cloudflare is available FREE with every HostPapa Business & Business Pro web hosting plan*. Cloudflare protects and accelerates any live website. Once your website is a part of the Cloudflare community, its web traffic is routed through Cloudflare's intelligent global network. And as this network grows, Cloudflare gets smarter and faster, providing greater website performance and security. State-of-the-art cloud-based network that efficiently processes millions of requests per second anywhere in the world. At the forefront of hardware, routing, and web-server technology, Cloudflare has built an innovative content delivery network. Easy to set up, extremely affordable, and consistently high performing, Cloudflare's cloud-based network efficiently processes millions of requests per second from anywhere in the world. The Cloudflare team builds all the hardware it needs from the ground up, and runs its own network. Because Cloudflare uses multiple data centres across the Internet – and around the world – your content will always be available, relatively near your site visitors. These strategically located "edge nodes" are essential to ensuring fast page load times and maximum performance. 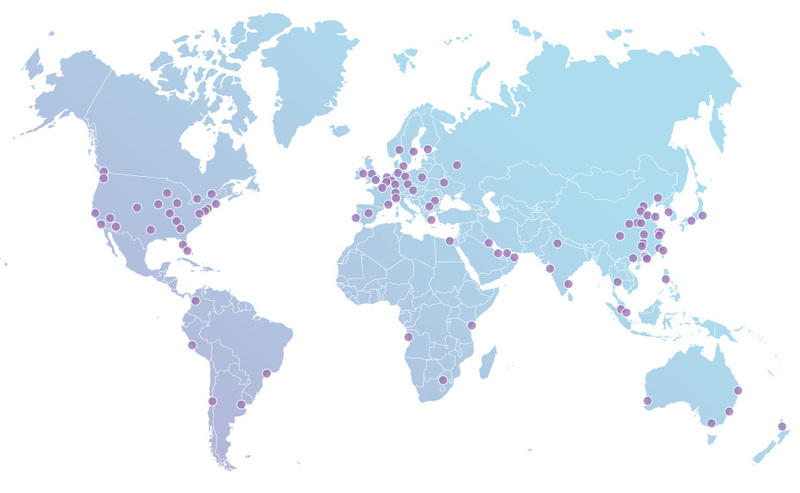 This map shows Cloudflare's key strategic locations – giving your website a true global presence. The basic plan is available at no extra cost* to you! Cloudflare's global content delivery network automatically caches static files at its edge nodes around the globe. This means your static files are stored closer to your visitors, and only your dynamic content is delivered directly from your web server. Cloudflare uses a technology called "Anycast" to route your visitors to the nearest data center. The result is that your website, on average, will load twice as fast for your visitors with Cloudflare, regardless of where they are located. If your server ever goes offline, Cloudflare will serve a limited copy of your cached website to keep it online for your visitors. Cloudflare builds the Always Online™ version of your website to showcase your most popular pages! Cloudflare's content delivery network will absorb surges in traffic, ensuring your server stays online. By enabling Cloudflare's core services, you will receive an average of 65% fewer requests to your servers and save 60% of your bandwidth. Thanks to Cloudflare's distributed network, if there is an issue in one data centre, visitors to the other data centres are unaffected. If the issue persists, Cloudflare will reroute visitors to the next closest data centre, offering a seamless experience for your visitors, even in the case of unexpected events. Cloudflare automatically caches your website's static content around the world, so it's always close to visitors. Cloudflare automatically caches your website's static content around the world, so it’s always close to visitors. True optimization, however, relies on much more. Cloudflare's suite of optimization tools ensures that every single webpage will load as efficiently as possible from any computer or mobile device, anywhere. Cloudflare users may choose to use some or all of the optimization tools – turn on, test, or turn off at any time. The final decision always rests with you, the webmaster! Intelligently caches objects and files needed to render your site using local storage on modern browsers and mobile devices. Your data will always be available and accessible to visitors! Minimizes the need for new requests. Automatically adjusts the cache header instructions so browsers will correctly cache the resources of a site for fast retrieval. Enables your HTML to render quickly, without needing to wait for slow scripts like widgets or advertising. Your web pages will feel much snappier! Automatically adjusts content delivery depending on the device accessing the site. This ensures maximum speed while maintaining the site's look and features – because every browser and every device works a bit differently! Reduces the size of all your files and delivers them quickly, completely intact. Because making a website half as big is as good as making the network twice as fast! Cloudflare provides security against all types of threats to keep your website safe. Cloudflare leverages the knowledge of a diverse community of websites and web developers to power a new type of security service. Online threats range from nuisances like comment spam and excessive bot crawling to malicious attacks like SQL injection and denial of service (DOS) attacks. Cloudflare provides security protection against all of these types of threats. Cloudflare's technology automatically detects new attacks against any website on its network. Once the threat is identified, Cloudflare will block the attack for both the particular website, and the entire community. Cloudflare lets you choose, simply, the security setting you want for your website. You can choose between I'm under attack!, High, Medium, Low, and Essentially off. Provide full defense, or stop only the worst threats. Behind the scenes, Cloudflare learns about your site and automatically tunes protection to your particular needs. Cloudflare shows you the list of threats that have been stopped from reaching your website in easy-to-read reports. You can sort and see threats by type, country of origin, and severity. Cloudflare protects against a range of threats: cross site scripting, SQL injection, comment spam, excessive bot crawling, email harvesters, and more. Understand where your website traffic is coming from. Reports help you analyze and monitor traffic from threats, bots, and crawlers. Did you know that threats and search engine crawlers can account for 20% to 50% of your website traffic? It's important you understand this traffic – but few analytics programs will even show it to you! Cloudflare reports will give you an in-depth look at visitor analytics, and help you monitor traffic from threats, bots, and crawlers. Most analytics programs, including Google Analytics, don't show you anything about unwanted visitors! Cloudflare gives you the lowdown on ALL visitors coming to your site, even the threats. Ever wonder which search engine crawlers are coming to your website? Cloudflare will help you! See how much bandwidth search engine crawlers consume and how that changes over time. Taking threat traffic analysis one step further, Cloudflare's threat control panel shows you threatening visitors by country of origin, type, IP address, and severity. The threat control panel is easy to manage, letting you add or remove IPs, IP ranges, and countries to your Trust or Block list. Cloudflare's traffic reports are simple to read: stream all the traffic coming to your site, or sort by time, visitor type, and traffic type. No more confusing log files to decypher! Integrate additional services or features into your website to improve visitor experience, enhance business, solve problems, and boost productivity. Use Cloudflare apps to integrate new features quickly, safely, and in just one click! Cloudflare apps works with any software platform. Cloudflare monitors the performance of any applications installed by apps. The application code will be positioned to maintain ultimate performance; if the app's servers ever run into issues, your site will be protected. Cloudflare apps works across platforms, software applications, content management systems (CMS) – anything that uses HTML. If your site is running multiple applications, this is the tool for you! Cloudflare lets you make changes in one place and applies them across your main website, blog, forums, micro-sites, and so on. This is perfect for ensuring an app – Google Analytics, for example – is installed on all the pages of your site. Services installed using Cloudflare apps are updated automatically. You'll always be using the latest version with the most recent feature and security updates. Cloudflare provides protection for your website – and that includes all applications you might choose to install. Each app is carefully reviewed and must meet a high security standard. If a problem or vulnerability is discovered, Cloudflare will either patch it or disable it until resolved. Apps distributed by Cloudflare always get along! Cloudflare removes any potential conflicts between services, and will alert you if you ever try to install two apps that can't work together. Cloudflare is a powerful, free* service that will supercharge your HostPapa website, making it faster, smarter, and more secure. Cloudflare represents a community of web developers working together to make the Internet a safer, more efficient place. Sounds good, doesn't it? Read on for answers to some of your most frequently asked questions. Cloudflare website optimization technology uses a number of techniques to improve your website performance. By routing your traffic through its global network, Cloudflare will inspect and filter out malicious requests, unwanted traffic, and other resource-draining requests. Cloudflare also provides caching for static content through their cloud-based content delivery network – putting your web information closer to your website visitors. Cloudflare also represents a community of web developers and website owners looking for the speed and security previously only accessible to large websites with dedicated staff. As the Cloudflare community grows, their services only improve. Activating Cloudflare will boost your website speed, security, efficiency, and overall performance. Cloudflare works as a reverse proxy. This means that once your website is part of the Cloudflare community, your web traffic is routed through Cloudflare's global network. Cloudflare's network also blocks threats and limits abusive bots before they hit your server, which means you will be wasting less bandwidth and server resources. What's the catch? Is Cloudflare really free*? Yes! HostPapa is a Cloudflare partner and the basic Cloudflare service is offered free* for our Business and Business Pro hosting plan customers. The core Cloudflare services are perfect for most websites; Cloudflare is quick and easy to set up and will noticeably boost website performance, security, and more. Will Cloudflare make my website faster? Cloudflare has great potential to speed up your website, for a few reasons. First, Cloudflare caches static content from your site and distributes it across their cloud-based content delivery network. Cloudflare has access to a number of data centres around the world, meaning content will be delivered to your visitors from the closest possible location. Cloudflare will also compress content for more efficient delivery. As well, Cloudflare inspects all traffic visiting your site and filters out malicious and unwanted traffic, reducing the number of hits to your site and reducing your overall resource demand. Websites load, on average, twice as fast, use 60% less bandwidth, and service 65% fewer requests when using Cloudflare. Increased speed can improve your search engine rankings and will encourage visitors to spend more time on your site. Cloudflare protects your website with security features such as hotlinking protection, the ability to block traffic by IP or country, email harvesting protection, and a number of other tools. Additionally, you will also be provided detailed statistics about your traffic, updated every 24 hours. Is Cloudflare easy to activate? Yes! To activate Cloudflare for your domains, simply access your cPanel via your HostPapa dashboard. From the cPanel home screen, click on the Cloudflare icon. You'll be able to create an account, learn about the service, make sure your site is Cloudflare enabled, and modify your security settings, all from the same place. How can I read more about Cloudflare and get help with their services? There are a number of useful articles about Cloudflare in the HostPapa knowledge base. If you require further assistance, please open a support ticket via your HostPapa dashboard. Where are Cloudflare's data centres located? Currently, Cloudflare has 12 data centres worldwide with points of presence in Hong Kong, Tokyo, Los Angeles, San Jose, Dallas, Chicago, New York, Ashburn, Amsterdam, Paris, Singapore, and Frankfurt. These strategic locations are some of the largest hubs for Internet traffic in the world. Cloudflare has plans to open additional facilities in London and Miami in the coming months. Cloudflare works for both static and dynamic websites. However, Cloudflare is not suitable for websites that stream video or audio directly from their origin server. Using YouTube or Vimeo for the videos embedded on your website is compatible with Cloudflare. Does Cloudflare provide any other services? In addition to web performance services, Cloudflare also provides a service called Cloudflare apps. This program allows for one-click installations of some of the most popular web apps available today, including products by Google, GlobalSign, and Pingdom. WordPress Plug-in: The Cloudflare WP plug-in will display your visitor's real IP, and not the IP of the Cloudflare proxy. This plug-in will also run optimizations on your database (it is not a replacement for caching plug-ins), and will let you report spam users to Cloudflare through your WordPress blog. Joomla Extension: This extension for Joomla will restore your visitor's original IP address, and not report the IP as one of Cloudflare's proxies. Drupal Extension: This Drupal extension for Cloudflare will restore your visitor's original IP and not report the IP as one of Cloudflare's. Rocket Loader: Rocket Loader automatically optimizes your pages to minimize your network connections and prevent third party services from slowing down your site. Hear from satisfied Cloudflare users! "As soon as we enabled Cloudflare, we saw a significant improvement. Cloudflare cut our load time in half, doubling the speed of our website for our readers in Europe, Asia and the US." "Since we started using Cloudflare, our users have constantly praised how quick the website is. We want to teach languages faster and without frustrations – spam and slow loading times can not be tolerated." "Cloudflare was instrumental in offloading the 5x increased traffic we experienced. Cloudflare automatically cached all the static images on our website, so our server didn't have to serve them. Cloudflare saved us 80% of requests to our server." Log in to your control panel today and get started! * Cloudflare is only available for Business and Business Pro web hosting customers. If you would like to add Cloudflare, simply upgrade your hosting plan by contacting Support via ticket or phone.